With about as much said as one could about New York Giants QB Eli Manning not starting for the first time in 210 games, the Oakland Raiders rushing attack emerged as the story of the game, tallying two scores and 119 yards on the ground in the Raiders 24-17 victory over the Giants. Raiders RB Marshawn Lynch set the tone early with a 51-yard touchdown run in the first quarter, finishing the game with 101 yards on just 17 carries. Filling in for Manning, former Jets QB Geno Smith played a relatively mistake-free game throwing the ball, albeit an unexciting one. He completed 21-of-34 passes for 212 yards and a touchdown to rookie TE Evan Engram, but also lost two fumbles of his own in the loss to the Raiders. With that, we give you our PFF-exclusive takeaways from the contest for each team. An uneven effort from Carr who can count himself extremely lucky not to have thrown a couple of interceptions with some errant passes that Giant defenders put on the ground. Carr wasn’t helped by his receivers who walked away with four drops but he’ll need to play better if the Raiders are to make a late surge to live up to their preseason hype. Of course he’ll feel more comfortable when he gets his receivers back and perhaps that will open up a deeper passer game after they attempted just four passes over 20 yards the entire game, completing one. That looked like the Lynch of old. He was decisive in his cuts and generating additional yardage with his power. Nothing of course quite encapsulated this like his run after the catch late in the fourth quarter where he made one defender miss, ran through two more, before dragging a tackler for additional yardage. Can Beast Mode kick start this offense? Just another ultra-productive performance from Mack who ultimately might have come up with the game’s pivotal play at the end of the second quarter. 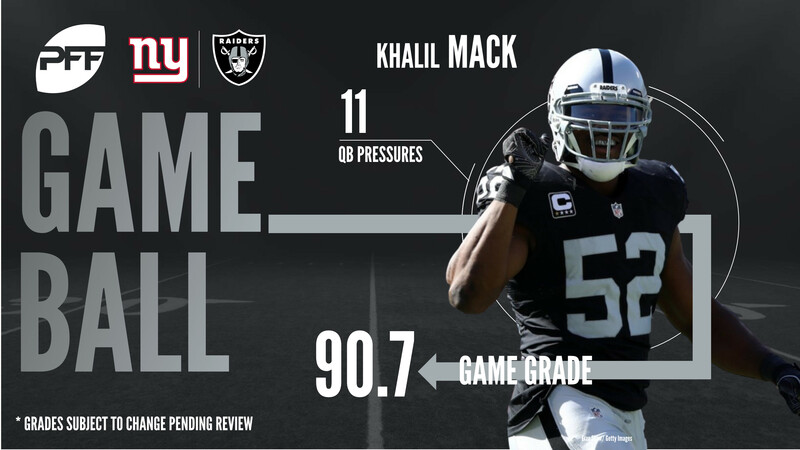 The sixth of Mack’s 11 pressures saw him tear past rookie RT Chad Wheeler for the fifth time in the first half, stripping and recovering the ball from Geno Smith in one swift motion to turn a red zone drive into no points on the board and maintain the Raiders’ slender lead. With the Giants focused in on the short passing game as the Raiders needed their defensive backs to step up and make plays on balls in front of them and McDonald did just that. Adding a pair of stops to a pair of pass defenses, both of McDonald’s PDs came on third down plays, driving on short passes to the sticks to turf the New York offense off the field twice on drives late in the third quarter. The Giants presented Geno Smith with a relatively conservative game plan to execute and Smith executed it well for the most part. Smith didn’t attempt a deep pass in the game and the majority of his passes attempted were short and outside the numbers to his right, often overcompensating to leave the throw outside to such an extent that it limited his receiver’s ability to gain yards after the catch, he only averaged 3.7 yards per attempt on passes short to the right. Smith worked the middle of the field well, especially at the intermediate level to offer some positives moving forwards but the two lost fumbles on sacks will hang against the efficient passing numbers. A yard shy of his first 100-yard receiving game as a pro but Evan Engram was once again the spark for the Giants’ offense. Engram was a contributor throughout in the passing games but two catches in the last six minutes of the game stand out even in this excellent performance. His superb double move in the endzone to split the Raiders’ defense brought the Giants back into the game with just over five minutes left and then THAT one-handed catch down the seam on the Giants’ final field goal drive was a special play from a special receiving threat. It’s almost noteworthy when Harrison loses a block, such is the control he exerts around the line of scrimmage. The Raiders might have three premium players on the interior of their line, but one-on-one neither were a match for the talents of Harrison, a player for whom no one can question the effort he is putting in. He led the team with four defensive stops in the game and now, with 29 run stops on the year, is tied for most of any defensive tackle along with Michael Pierce. One of, if not the, best players of the run of his generation with the kind of consistency you just don’t see all that often. Not a bad effort from Vernon, but he was far too queit rushing the passer. For those who hoped he might kick on after his three-sack effort against the Chiefs, it just wasn’t there as the unit as a whole struggled to lay a finger on Derek Carr. Vernon had just two pressures despite playing every snap and is up to just 24 combined sacks, hits and hurries on the year. That’s good for second on the team and while he has missed time and may not be 100 percent, more is to be expected from such a talented player.